Collins Booksellers - 21st Century Kinematics by J. Michael McCarthy, 9781447145103. Buy this book online. 21st Century Kinematics focuses on algebraic problems in the analysis and synthesis of mechanisms and robots, compliant mechanisms, cable-driven systems and protein kinematics. The specialist contributors provide the background for a series of presentations at the 2012 NSF Workshop. The text shows how the analysis and design of innovative mechanical systems yield increasingly complex systems of polynomials, characteristic of those systems. In doing so, it takes advantage of increasingly sophisticated computational tools developed for numerical algebraic geometry and demonstrates the now routine derivation of polynomial systems dwarfing the landmark problems of even the recent past. 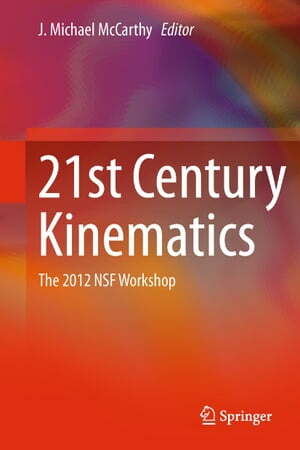 The 21st Century Kinematics workshop echoes the NSF-supported 1963 Yale Mechanisms Teachers Conference that taught a generation of university educators the fundamental principles of kinematic theory. As such these proceedings will provide admirable supporting theory for a graduate course in modern kinematics and should be of considerable interest to researchers in mechanical design, robotics or protein kinematics or who have a broader interest in algebraic geometry and its applications.